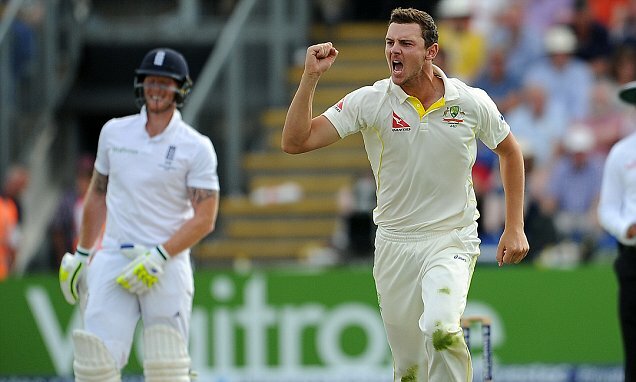 Fast bowler Josh Hazlewood will miss Australia’s one-day tour of England with a back injury. Josh Hazlewood ruled out of England tour by back injury and is replaced by uncapped Michael NeserCricket Australia announced Josh Hazlewood has ‘low-level bone stress’ in backHe’ll miss Australia’s one-day tour of England and Michael Neser has taken placeHe has been replaced in squad already missing Mitchell Starc and Pat Cummins ByPress Association Sport Staff Published: 05:48 EDT, 28 May 2018 | Updated: 05:48 EDT, 28 May 2018Fast bowler Josh Hazlewood will miss Australia’s one-day tour of England with a back injury. Cricket Australia has announced that Hazlewood, who took 21 English wickets during the Ashes, has ‘low-level bone stress’ in his back. Fast bowler Josh Hazlewood will miss Australia’s one-day tour of England with a back injury’Josh has been managing some low-level bone stress in his lumbar spine for a short period,’ Cricket Australia physiotherapist David Beakley said. He’s been replaced in squad already missing Mitchell Starc and Pat Cummins by Michael NeserIt means England will meet a squad drastically different to the one it faced Down Under over the winter.